Using cameras, sections, views and details are quickly generated. These commands are on the Standard toolbar. Step 1. Create a new camera type. To create a new camera type for the camera properties drop-down list, you must access the "AstorBase.mdb" database in: C:\Documents and Settings\All Users\Application Data\Graitec\AdvanceSteel\2010\Steel\Data. 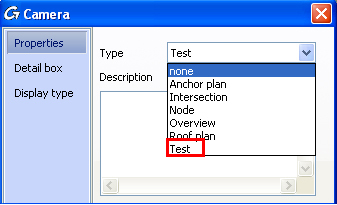 In the "CameraTypes" table add a row with the field name you want, for example, "Test". Step 2. Create a new camera, "Model objects". For this new camera to appear in the "Process/Objects selection/Model Objects" field it, access the "AstorDetailsBase.mdb" database in: C:\Documents and Settings\All Users\Application Data\Graitec\AdvanceSteel\2010\Kernel\Data. 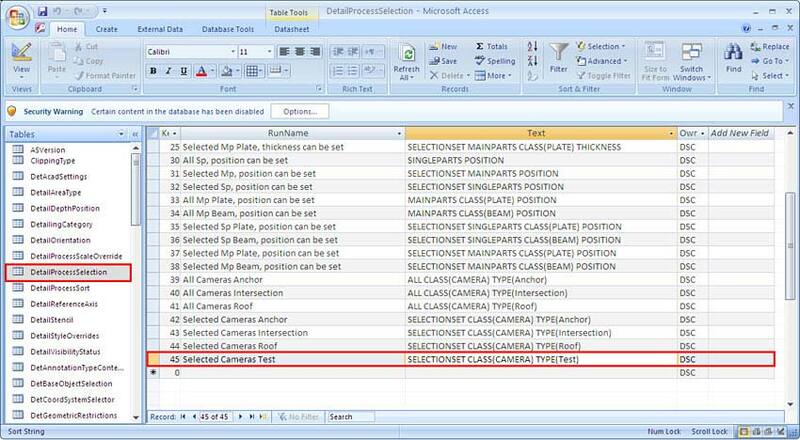 In the "DetailProcessSelection" table add a row according to the process you want to use: "Selected cameras" or "All cameras". - For "selected cameras process" enter "Selected Cameras Test" in the "RunName" field and "SELECTIONSET CLASS(CAMERA) TYPE(Test)" in the "Text" field. - For "all cameras process" enter "All Cameras Test" in the "RunName" field and "ALL CLASS(CAMERA) TYPE(Test)" in the "Text" field. Step 3. Create a new drawing style. If this camera type should have its own drawing style, create a drawing style with the "New" command, or modify a copied drawing style, using the "Copy" command, in the "Drawing style manager". Create this drawing style in the "Camera" category. For this example, a drawing style, named "Test", is created. Step 4. Create a new drawing process. 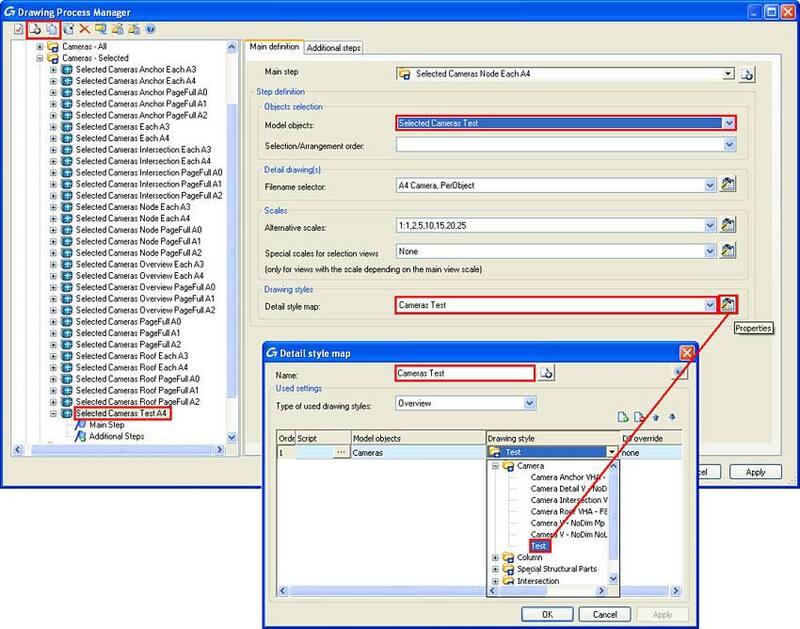 Create a new process with the "New" command, or modify a copied process, using the "Copy" command, in the "Drawing Process Manager". 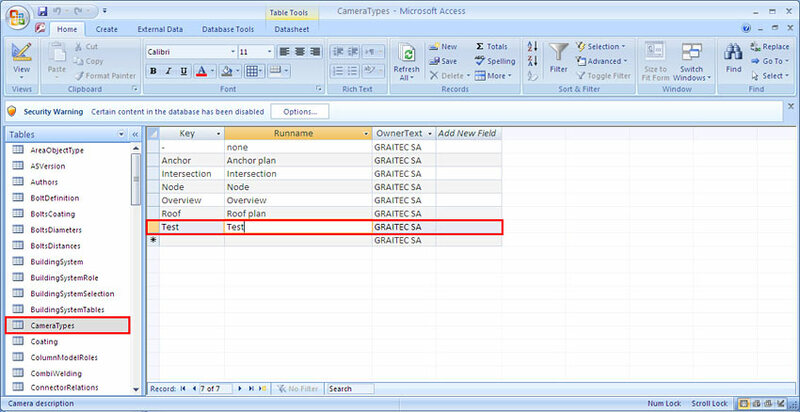 Create this process in the "Cameras-All" or "Cameras-Selected" category according to the camera selection. 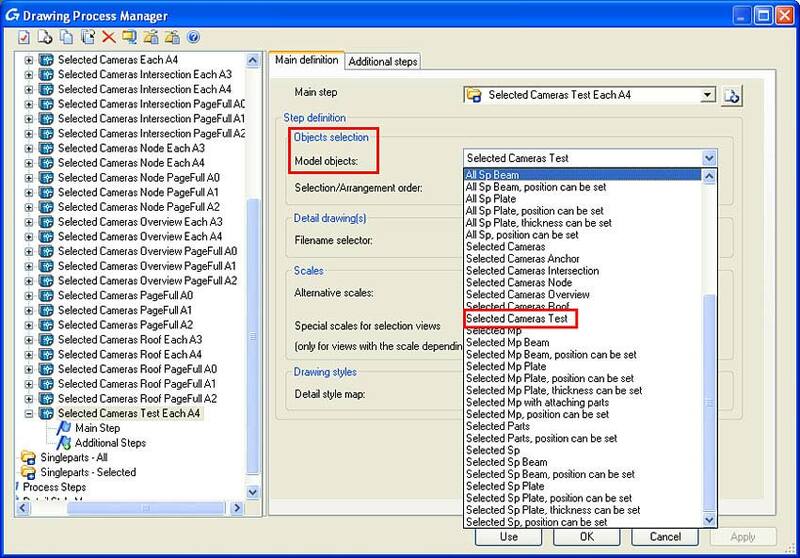 In the "Model objects" field choose the camera selection (filter) you created in the database in Step 2. In the "Drawing styles" properties select the drawing style you created in Step 3.